BoardsWork! enables business employees to be citizen philanthropists. We train, match, and support them to serve as effective members of a nonprofit’s board of directors. We support the nonprofit and the board member for a year through our catalog of more than 100 noncredit classes through the Bayer Center for Nonprofit Management. 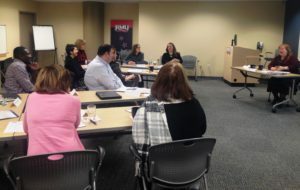 Director Peggy Outon trains business professionals in effective and engaged board governance at a mixed cohort session. The nonprofit organizations become stronger with new, diverse individuals and skill sets. And businesses become stronger when employees become social leaders and advocates in the community. Learn more about BoardsWork! and our upcoming trainings. Register today as an individual for one of our upcoming mixed cohorts. Complete an engagement assessment to get your company involved.